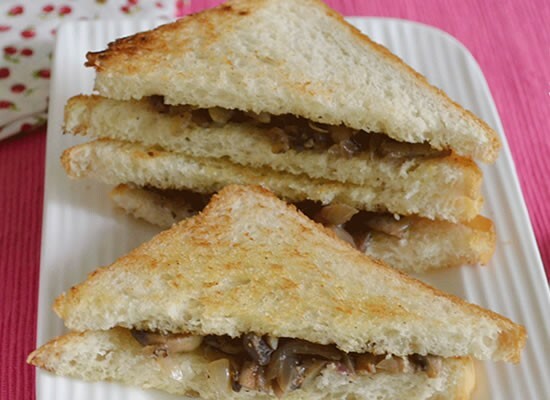 A simple, delicious and easy to make sandwich with mushrooms and paneer. Perfect for a light lunch or a dinner, these Mushroom Paneer Sandwiches also make for a great lunchbox or evening snack. 2. Grind the peppercorns, ajwain, cumin seeds and cloves to a fine powder. 4. Saute the onions and ginger for 4 to 5 minutes. 5. Add the ground powder, turmeric powder and salt. 6. Add the tomatoes, green chillies and saute for another 8 to 10 minutes. 7. Add the mushrooms and crumbled paneer. 8. Saute for an another 2 to 3 minutes and switch off the flame. 9. Toast the bread slices and place them on a flat surface. Butter them if desired. 10. Divide the mushroom-paneer mixture among half of the slices and cover with the remaining slices. 11. Halve or cut into quarters if desired. Feel free to comment or share your thoughts on this Mushroom Paneer Sandwich Recipe from Awesome Cuisine.